PURPOSE OF THE WORKSHOP The purpose of this workshop is to identify and discuss candidate locations where humans could land, live and work on the martian surface. KEY TERMS We refer to such a location as an Exploration Zone (EZ). 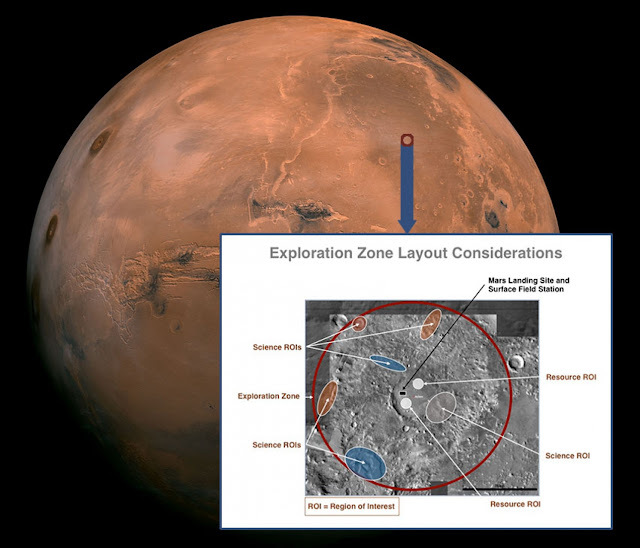 Given current mission concepts, an Exploration Zone is a collection of Regions of Interest (ROIs) that are located within approximately 100 kilometers of a centralized landing site. ROIs are areas that are relevant for scientific investigation and/or development/maturation of capabilities and resources necessary for a sustainable human presence. The EZ also contains a landing site and a habitation site that will be used by multiple human crews during missions to explore and utilize the ROIs within the EZ. First Landing Site/Exploration Zone Workshop for Human Missions to the Surface of Mars FIRST ANNOUNCEMENT October 27–30, 2015 Houston, TX These candidate EZs will be used by NASA’s Human Exploration and Operations Mission Directorate (HEOMD) and Science Mission Directorate (SMD) as part of the multi-year process of determining where and how we would like to explore Mars with humans. In the near term this process includes: (a) identifying locations that would maximize the potential science return from future human exploration missions, (b) identifying locations with the potential for resources required to support humans, (c) developing concepts and engineering systems needed by future human crews to conduct operations within an EZ, and (d) identifying key characteristics of the proposed candidate EZs that cannot be evaluated using existing data sets, thus helping to define precursor measurements needed in advance of human missions. Existing and future robotic spacecraft will be tasked to gather data from specific Mars surface sites within the representative EZs to support these HEOMD and SMD activities. It is anticipated that funding and support for future calls will be available for teams of scientists and engineers to conduct detailed characterizations of the EZs that emerge from this workshop. HOW TO PARTICIPATE All members of the scientific and human spaceflight communities are encouraged to participate in this important activity. The workshop will consist of presentations of the EZs and ROIs that have been proposed as part of a call to be described in the second announcement. This second announcement will include detailed information regarding what and how to propose EZs and/or science/resource ROIs that could potentially be aggregated into an EZ. WORKSHOP LOGISTICS The workshop will be held at the LPI in Houston, TX and there will be no registration fee, but registration will be mandatory for attendance. Due to space limitation, while it is hoped to allow everyone who wishes to attend, it might be necessary to limit attendance to people who submit proposals for EZs and/or science/ resource ROIs. NASA employees and contractors should note that this workshop is classified as a conference and therefore that NASA Conference Tracking (NCTS) rules apply. Input from the science and human spaceflight communities are critical to identification of optimal landing sites for future human missions to the surface of Mars. We look forward to your involvement in these activities!